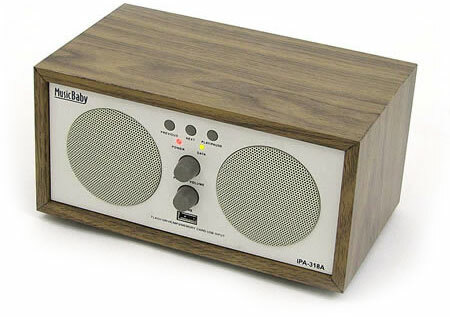 The Evergreen DN-MPS100 Music Baby is a speaker enclosure that amounts to simplicity in a box. Plug in a USB flash drive loaded with MP3s, and sit back as sweet music wafts through the Music Baby s two speakers. Its built-in 7-watt amplifier might not have enough oomph to crank out a wall of sound, but then it's bargain-priced at $60. Now this is what they meant by the term plug-and-play —you plug, it plays.